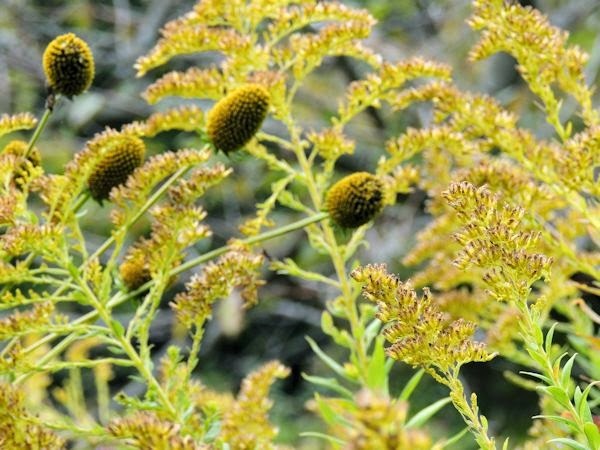 I recently had the pleasure of an early fall visit to Planting Fields Arboretum in late September. 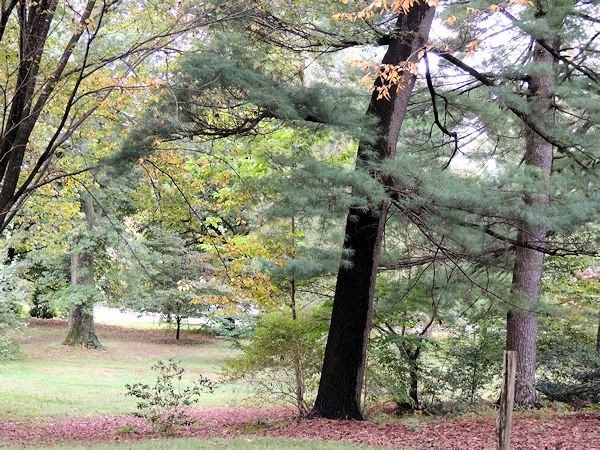 Planting Fields Arboretum is a Gold Coast Era Estate located on the North Shore of Long Island. 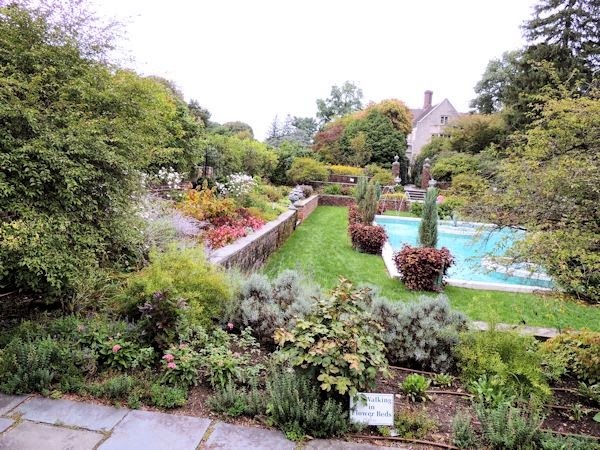 First built in 1904 by prominent New Yorker James Bryne, Planting Fields was purchased as a spring country home by William Robertson Coe and his wife Mary "Mai" Huttleston Coe in 1913. After Mai's death in 1924, Mr Coe remarried and remained in residence with his wife Caroline Graham Slaughter and his four children until his death in 1955. 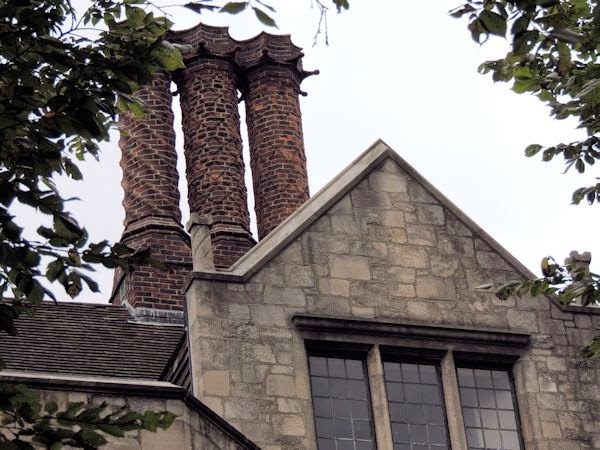 At that time the property was deeded to the State of New York and Caroline remained in the Manor House until her death in 1960. Planting Fields now exists as a historical landmark. 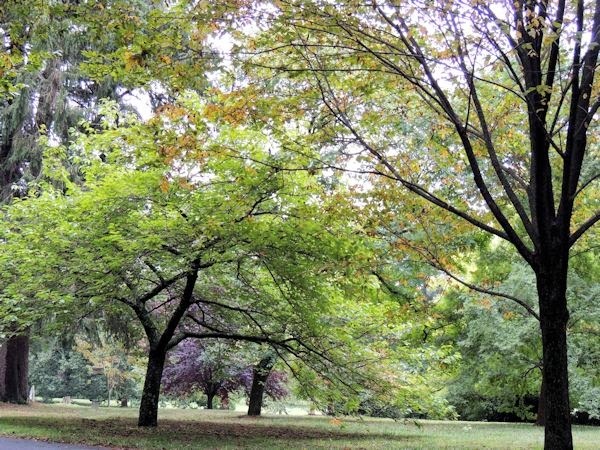 As you enter the 409 acre park a vast great lawn with majestic trees is within view. 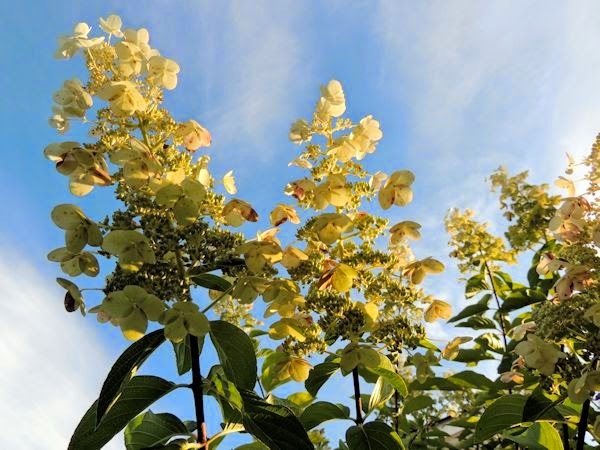 Hues of golds and oranges are appearing early this year as it is just turning to fall. 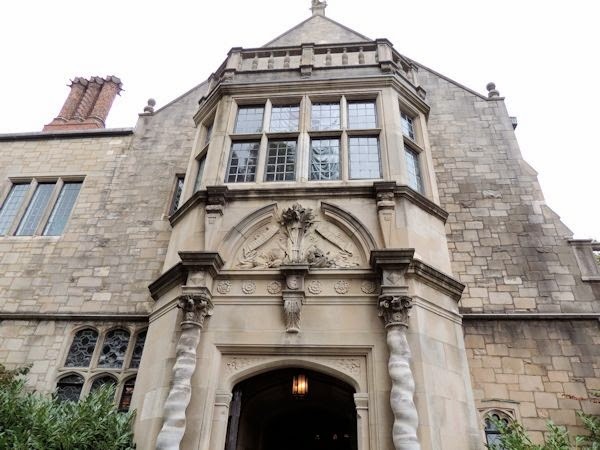 The main residence Coe Hall is a 65 room Tudor-Revival Style mansion developed by Walker & Gillette replacing an earlier Queen Anne Style house that burned in 1918. 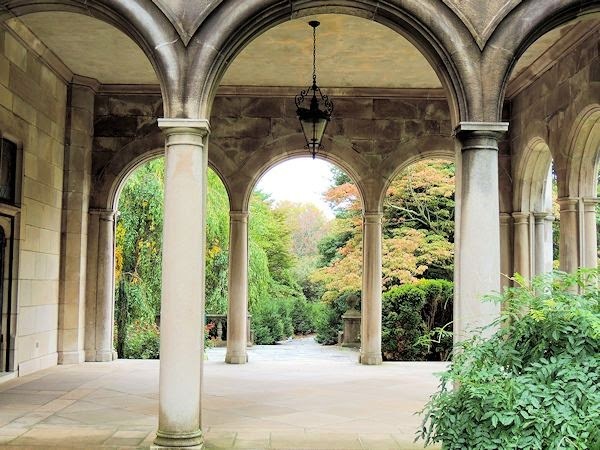 An outdoor living area was created by the terraces and arches seen here that lead to the Italian Garden nearby. 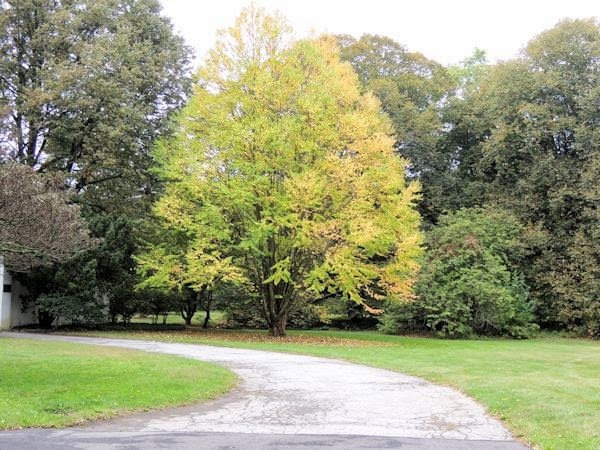 Many mature Beech Trees exist at Planting Fields Arboretum. 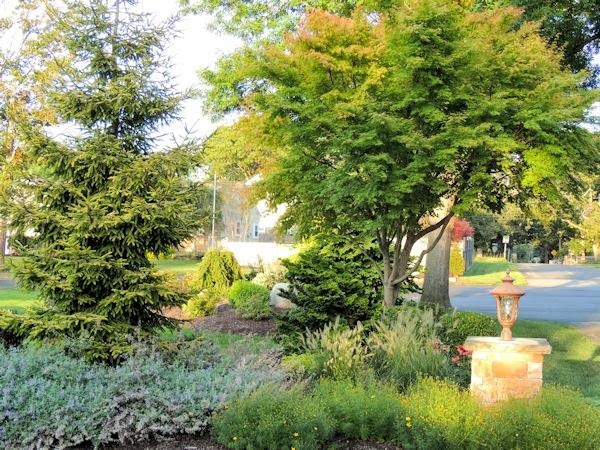 For a little bit of history...In 1915 two gigantic beeches from Fairhaven Massachussetts, the childhood home of Mary “Mai” Huttleston Coe, were ferried across the Long Island Sound to Planting Fields. 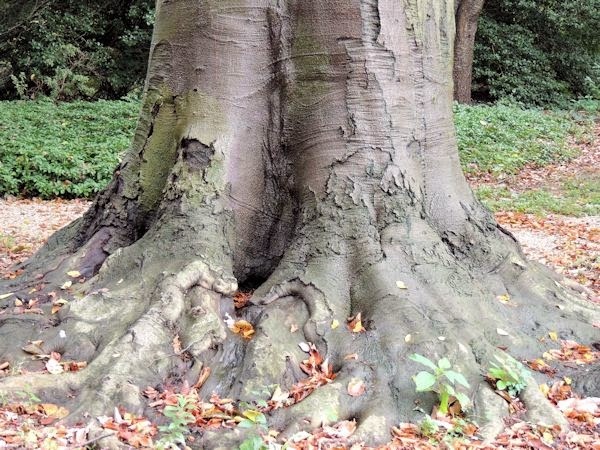 Only one of the trees possessing a 30 foot wide root ball survived the journey and lived until 2006. 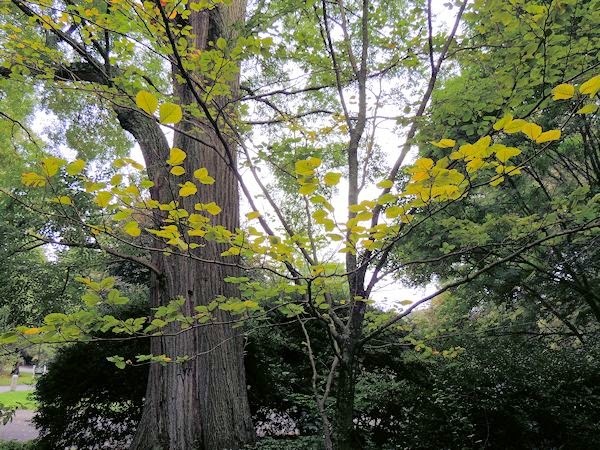 The legend of the tree lives on today as seedlings were collected from the "Fairhaven Beech" from 2000-2005 and a new tree was started in the back lawn of the mansion. 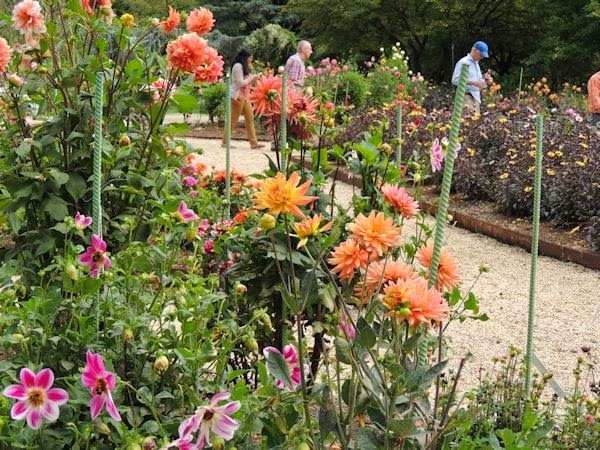 The Dahlia Garden planted in the spring of 1998 is known to be one of the largest and most spectacular dahlia collections in the Northeast consisting of 400 plants. 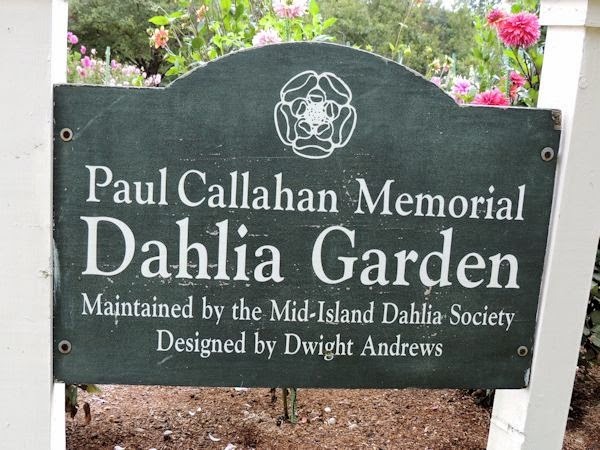 The Mid Island Dahlia Society's members donate nearly 2000 hours a year maintaining these magnificent gardens. 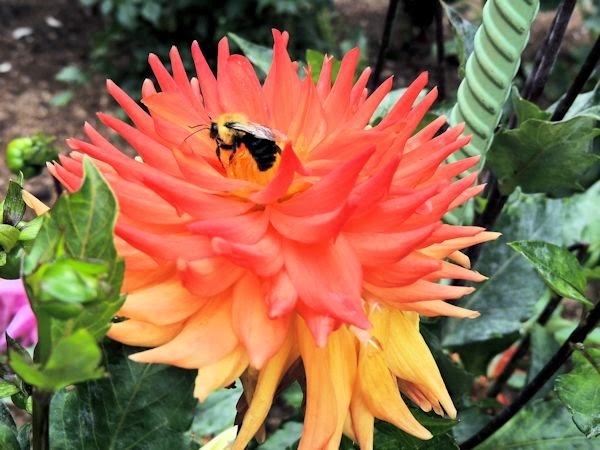 The Dahlia Garden is in bloom from August through October and is one of the highlights of the estate. 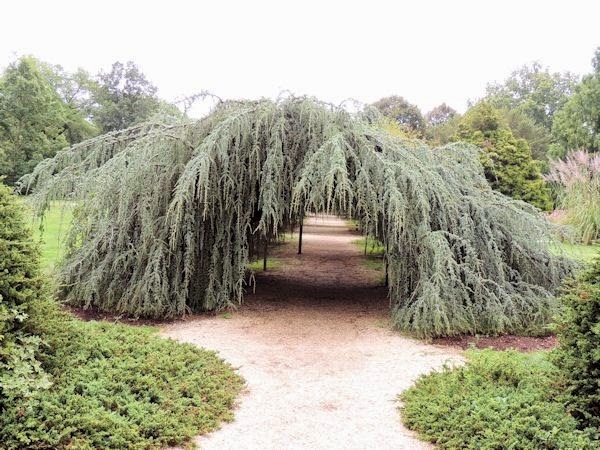 This magnificent living arbor leading to the greenhouse is formed by just four Weeping Blue Atlas Cedars at approximately twenty feet apart cascading over a supporting frame. 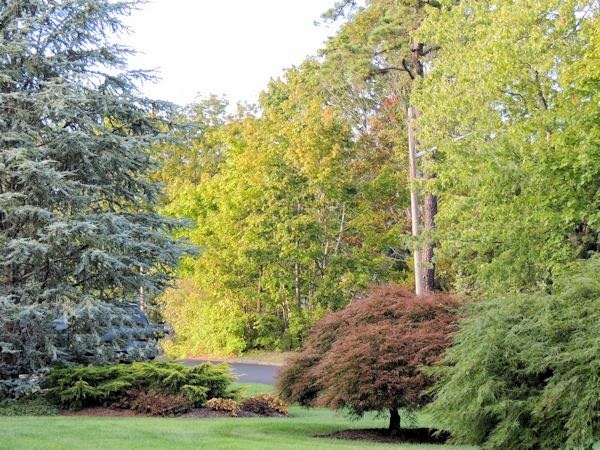 These majestic Cedars are just some of the many mature specimen trees at Planting Fields. 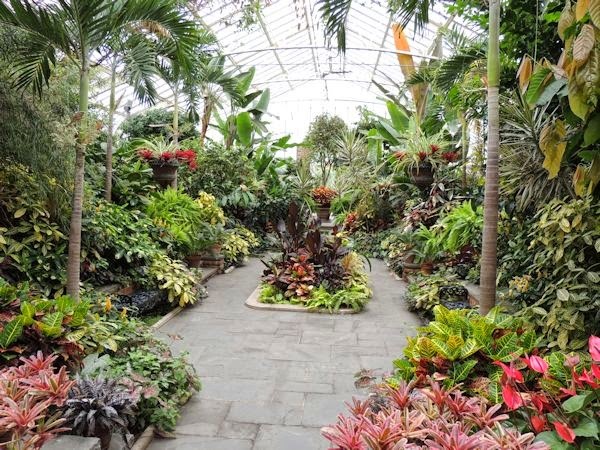 There are several greenhouses on the estate property. 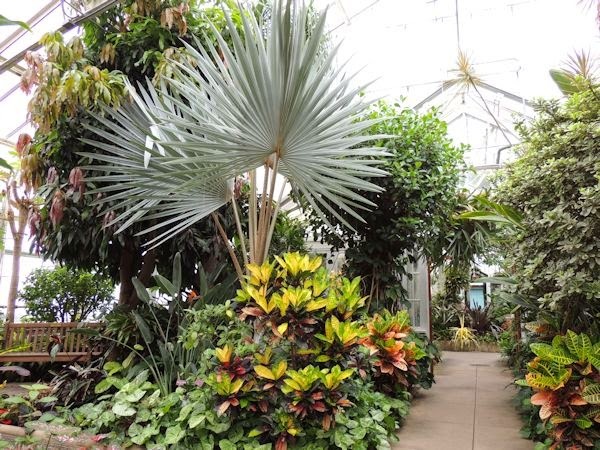 The large central Main Greenhouse constructed between the years of 1914-1929 is my favorite harboring a variety of tropical plants. 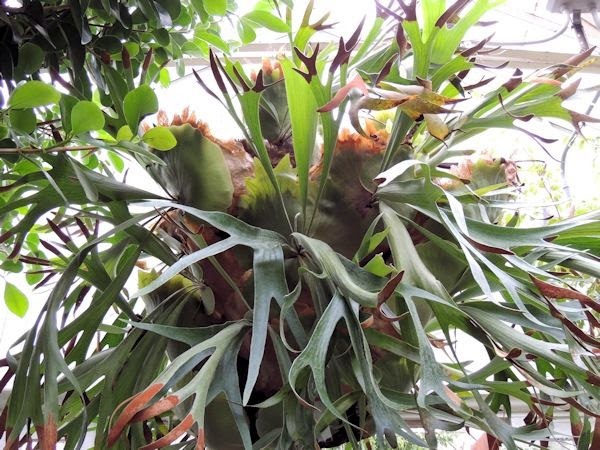 Seen here are numerous species of tropical plants including bromeliads, anthurium, palm trees, croton, and hanging planters as the one pictured below displaying the most magnificent Staghorn fern I have ever seen. 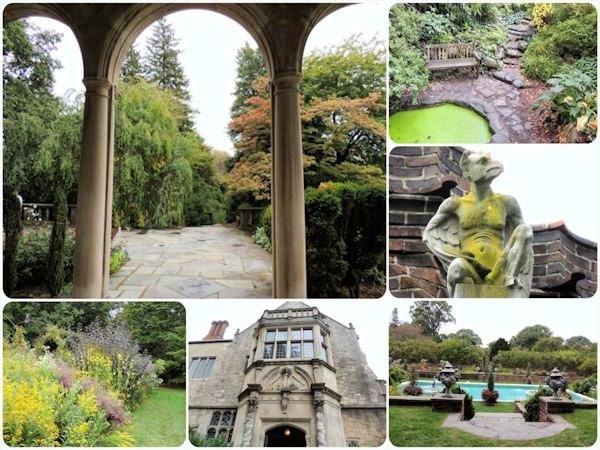 The Italian Blue Pool Garden was originally the site of a tennis house and court that was transformed into a Tea House in 1915 and surrounding perennial gardens in 1918. 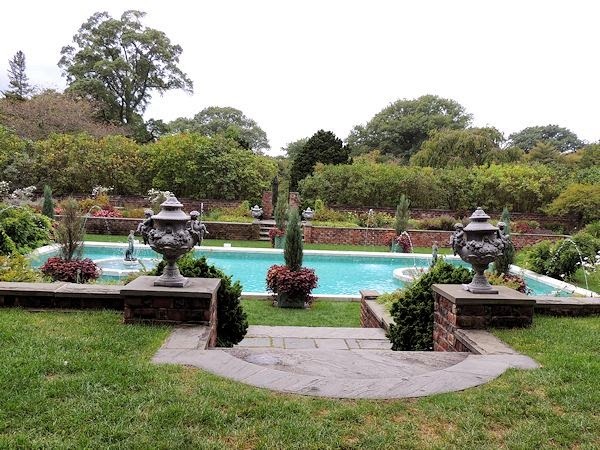 Seen from the mansion, a rectangular pool with fountains bordered by raised planting walls and English country style gardens form a beautiful display. 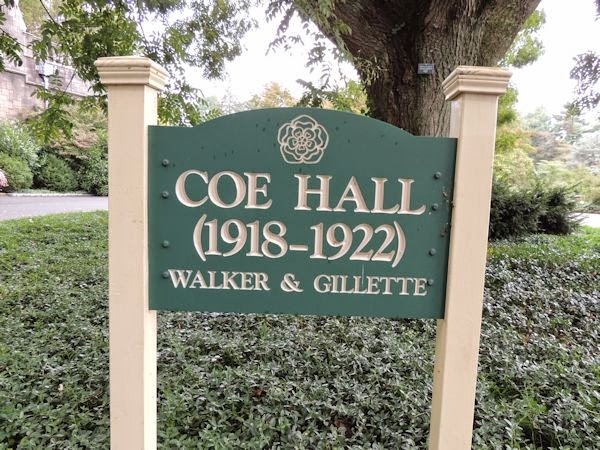 It was known to be one of Mrs. Coe's favorite areas on the property. 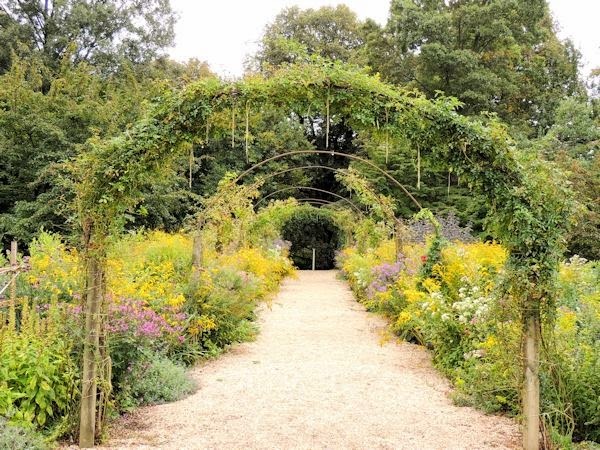 The vine covered arches and perennial gardens of Planting Fields are one of my favorite areas to visit. 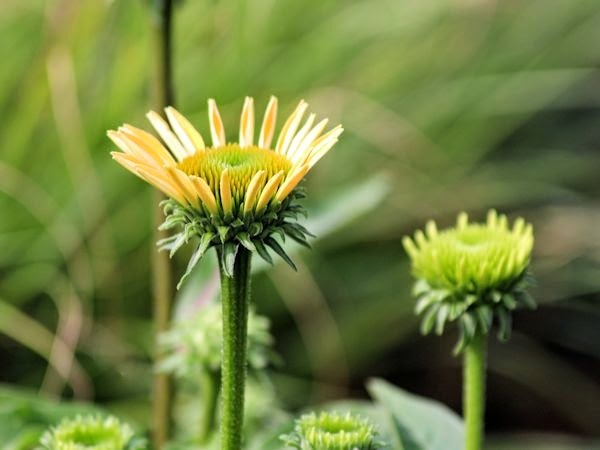 At this time of year (late September) combinations of daisies, sunflowers, goldenrod and asters are at their prime displaying a mixture of yellow, white and purple blooms throughout the garden. 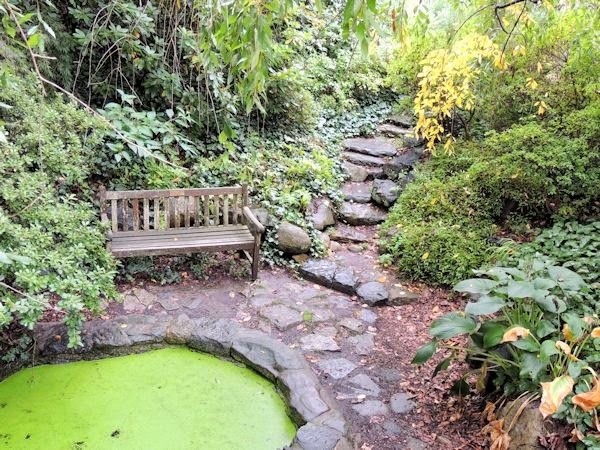 There are also many serene and tucked away sitting areas like the one shown here at the back area of the mansion...perhaps a quiet retreat. Leaving the park, majestic trees tower overhead in the serene setting and another visit is complete. Planting Fields Arboretum State Historic Park is a beautiful place to visit anytime of year as the gardens change with each season for a constant breathtaking display. 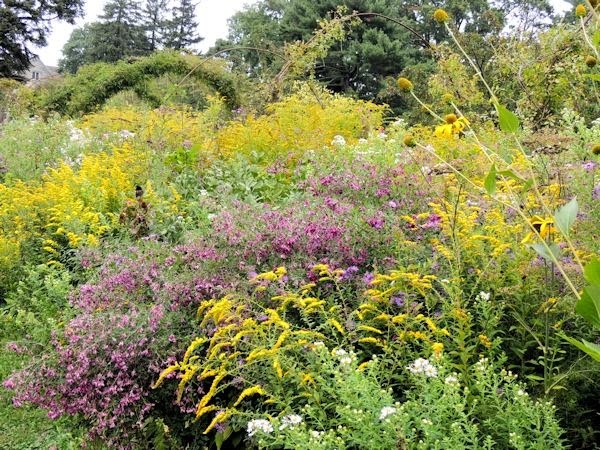 For more on visits to Planting Fields visit my other posts at Planting Fields Arboretum July and Planting Fields Arboretum August. 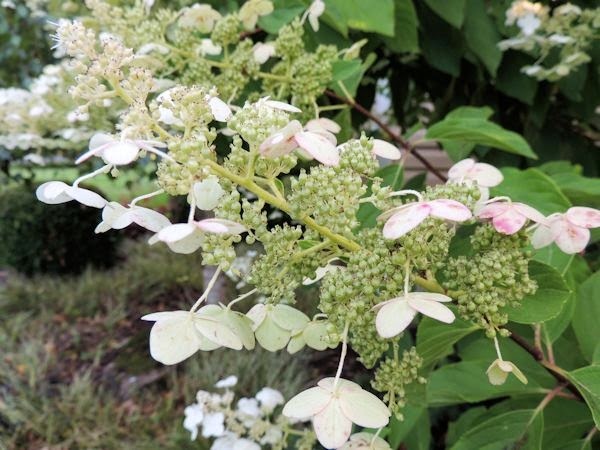 Welcome to another Garden Bloggers' Bloom Day and Foliage Follow-Up for the month of September. 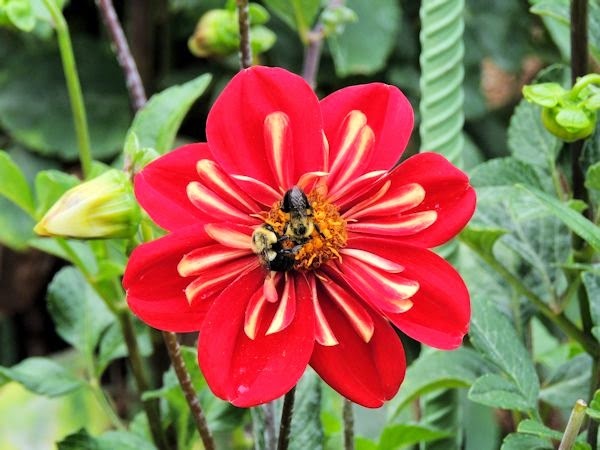 Fall arrives in less than a week but the blooms are more vivid than ever in the garden. 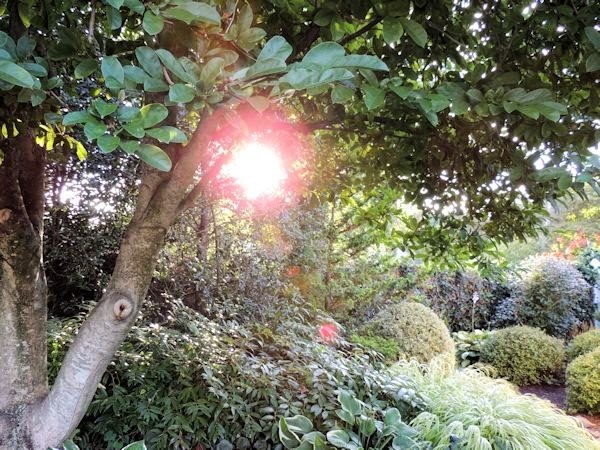 It has been an unusual gardening year weather wise with a severe winter followed by a cool and moist spring and a cooler and drier summer than usual. We had our warmest days of the summer the first week of September with temperatures in the 80's with high humidity but now the temperatures are regulating in the 70's and there are signs of fall. 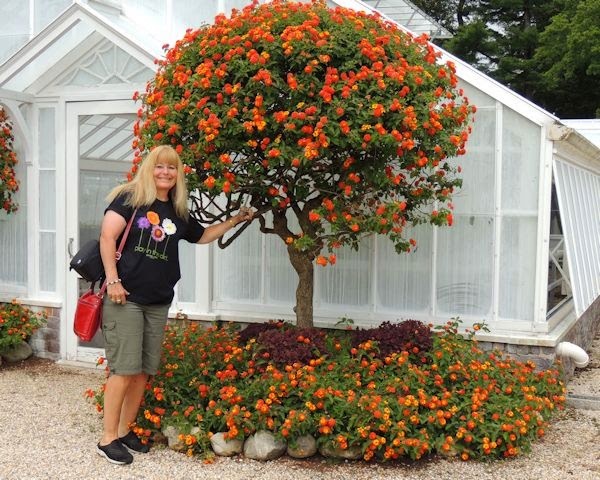 I have been enjoying the garden and invite you to take a tour with me so come along and see! 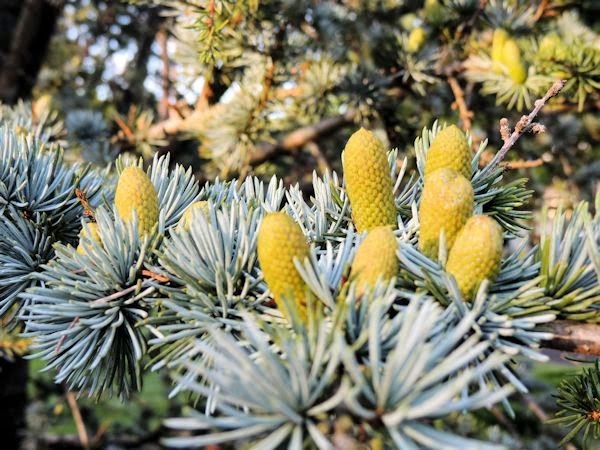 In the front yard showy cones are forming on the spiky blue foliage of the Blue Atlas Cedar (Cedrus atlantica Glauca) showing signs of fall. This tree now towers at approximately fifty feet! 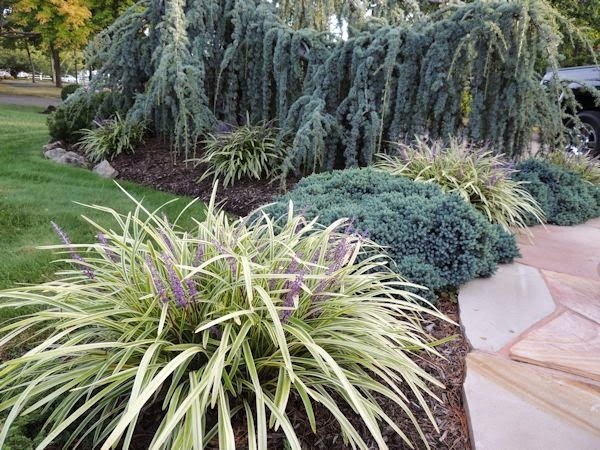 The grasses are showing off their wonderful plumes and the Coral Bark Maple (Acer palmatum 'Sango kaku' is already turning to shades of yellow. 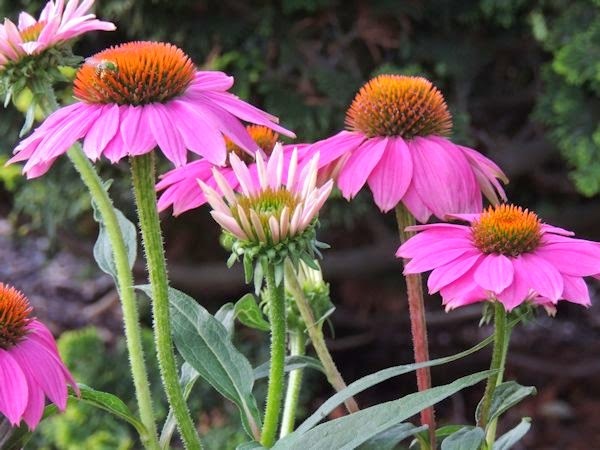 I have been enjoying one of my newest additions to the front garden beds, Echinacea PowWow 'Wild Berry'. 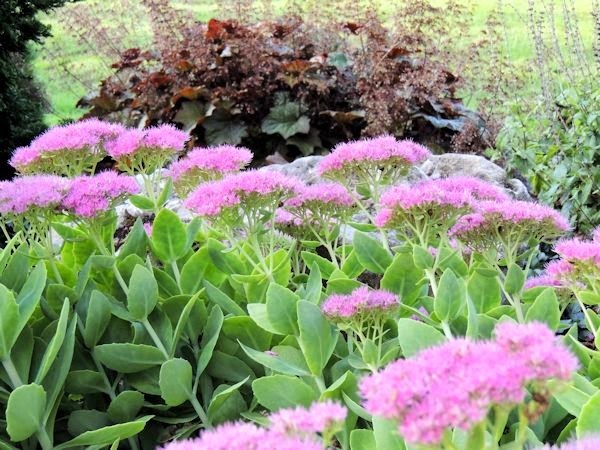 Their deep pink hue and ability to attract butterflies is a benefit to the garden. 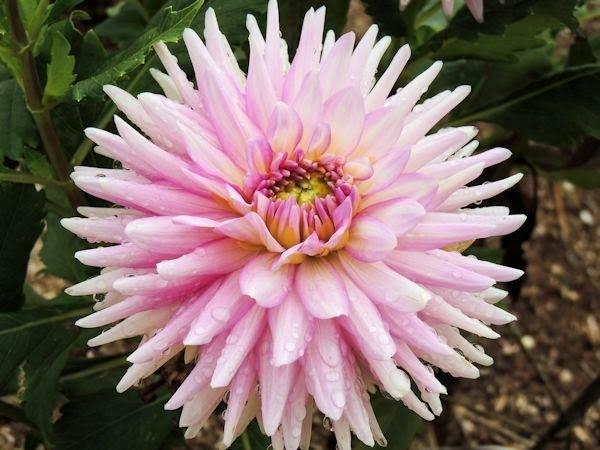 Another variety that I have added is 'Cheyenne Spirit' which displays hues of pink, orange,yellow and cream all on the same plant. We will visit that one as we come to the other side of the garden! 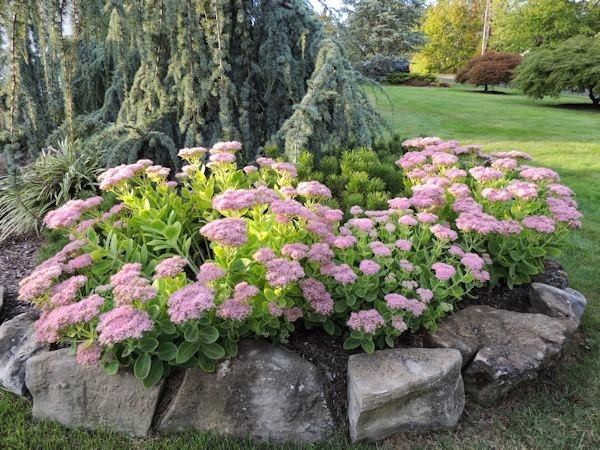 A favorite of mine at this time of year is Sedum 'Brilliant'. 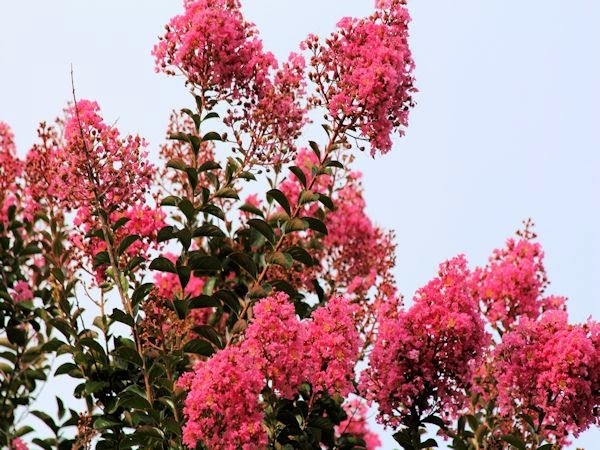 It is a sure sign of fall with its late blooming brilliant pink color. Heucheralla 'Buttered Rum' was a new find in the past month at the local nursery. 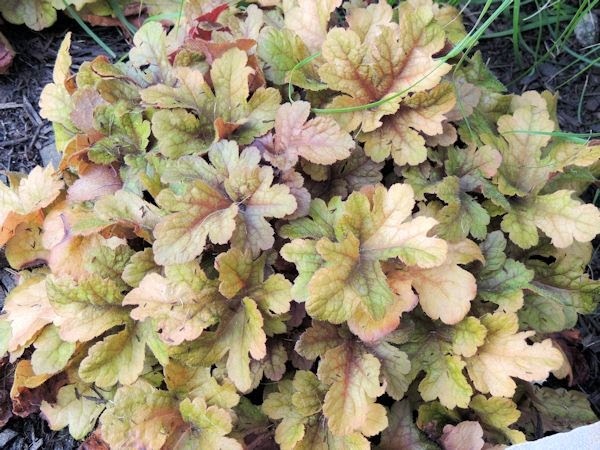 It is a hybrid mix between a Heuchera and Tiarella and is supposed to stay evergreen throughout the winter....updates next spring! I am enjoying its caramel and rum colored mixture of foliage. and a close up against the blue "almost" autumn sky. 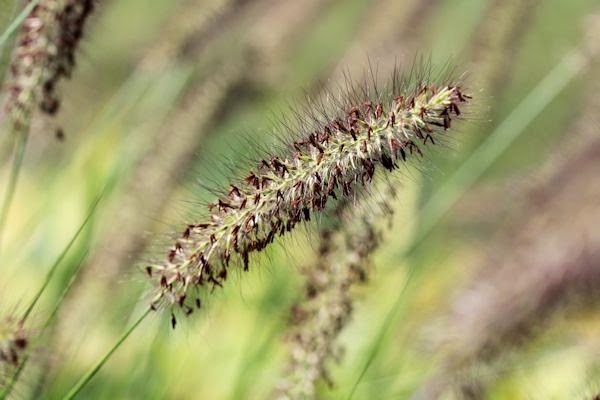 The Japanese Forest Grass has unusually large plumes this year as it is reaching about two feet in diameter. 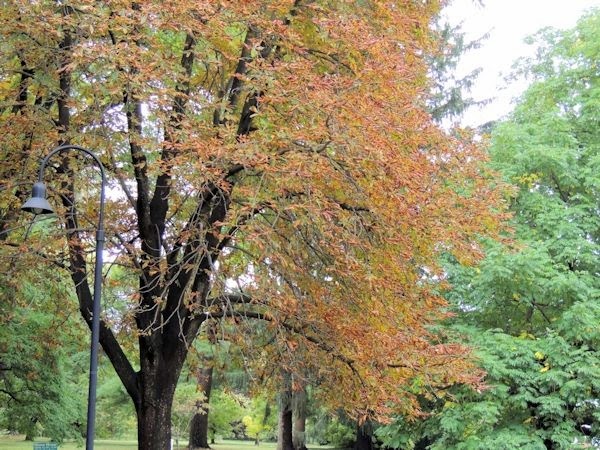 Here are some more signs of fall. 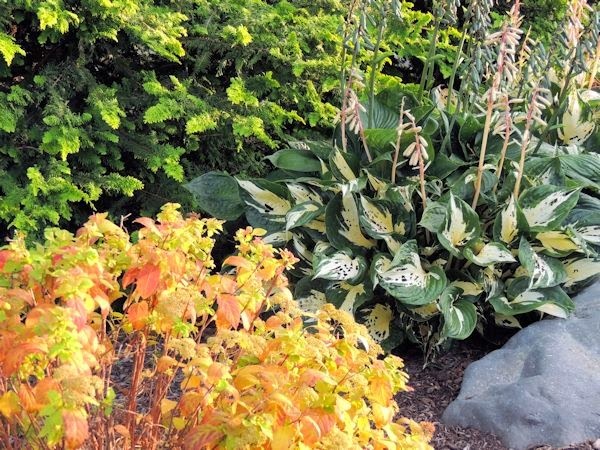 The Spirea Double Play are turning to hues of gold and orange and the hosta blooms are forming their seed heads. 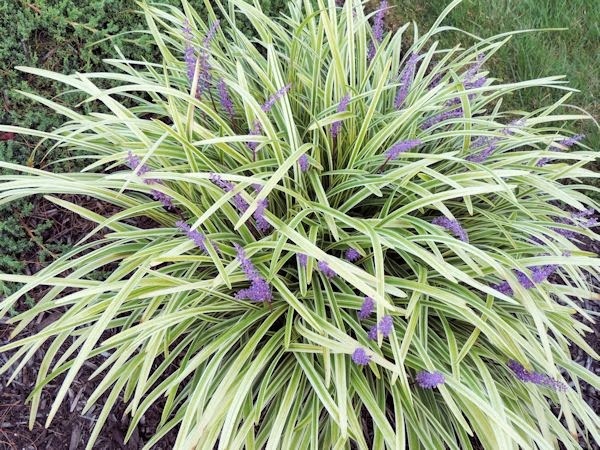 Liriope is a welcomed sight in the garden in September with its flower spikes of vibrant purple as you can see here. 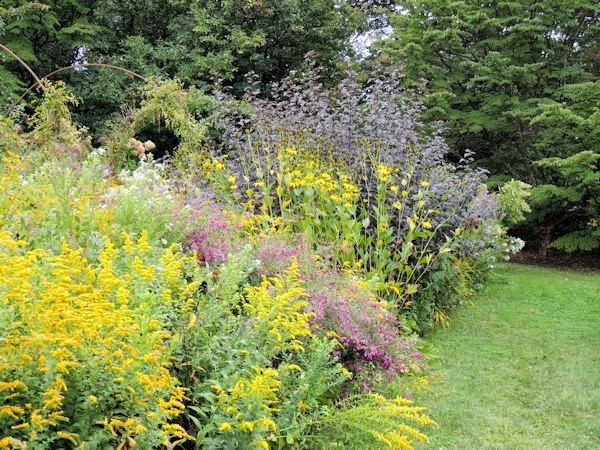 As we move along to the back gardens the perennial border is in September mode. 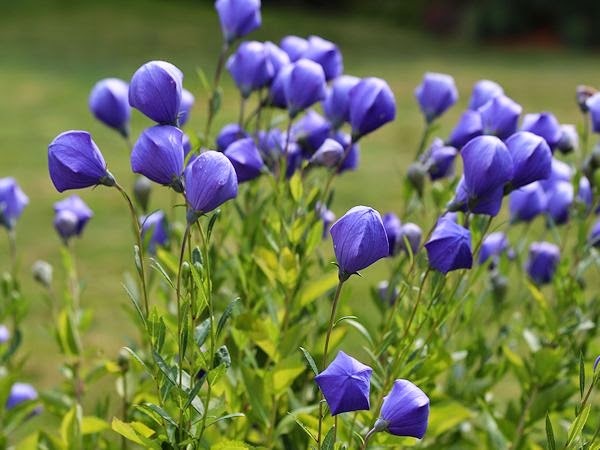 You can see the Platycodon (Balloon Flower) is displaying its blue blooms. We'll get a little closer up later on. 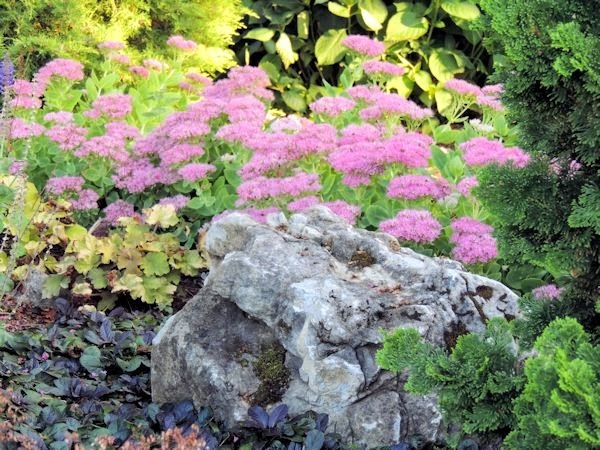 Here is a bloom and foliage combo of Sedum 'Brilliant' against Heuchera 'Palace Purple' (Coral Bells) in the backdrop. 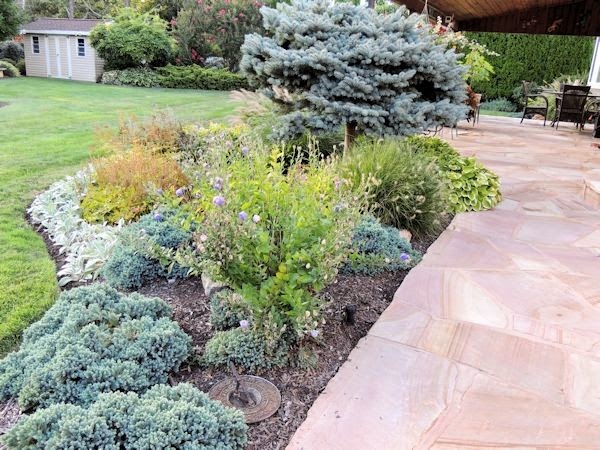 Here is another combo of Sedum with Weeping Blue Atlas Cedar and Mugo Pine. 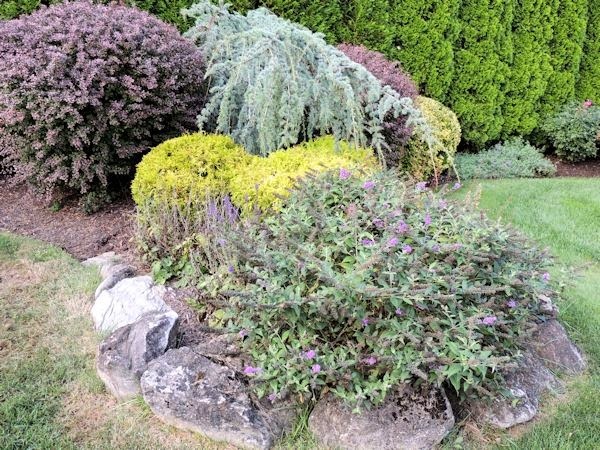 This dwarf Butterfly Bush Lo & Behold 'Blue Chip' as proven to be a winner and is in bloom again for this mid-September garden. I have seen a few Swallowtails and Monarchs on it this season but the numbers of butterflies have seem to gone down. I enjoy seeing the ones I can. This is a scene of the street from my front yard in late afternoon. I was amazed by the hues of the trees in the background turning to shades of golds and oranges already. It is really starting to look like fall and I think it is a combination of the dry summer we have had and the sudden drop in temperatures over the past couple of weeks after the few days of a heat wave. 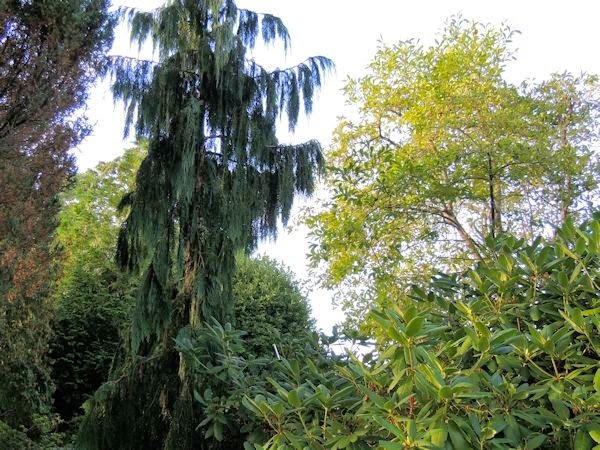 and the Weeping Blue Atlas Cedar now reaches to approximately fifteen feet in length! 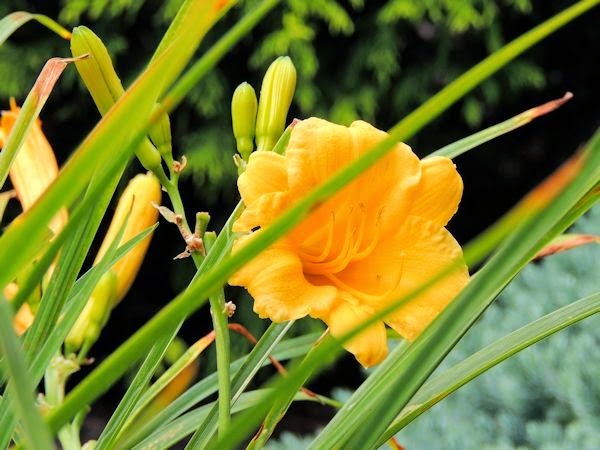 and Hemerocalis (Daylily) 'Stella D Oro' in bloom. This is the second bloom for the daylily after I rejuvenated them in August. 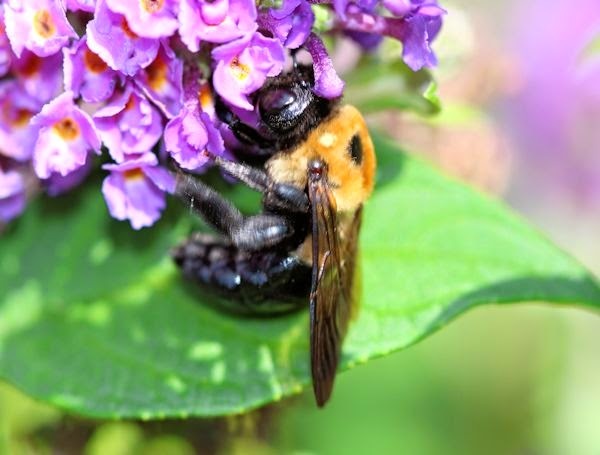 Here a bumble bee that I captured with the telephoto lens and below is Crape Myrtle 'Sioux' with its mildly fragrant deep pink blooms from a telephoto view. The tree is now about 25-30 feet high. 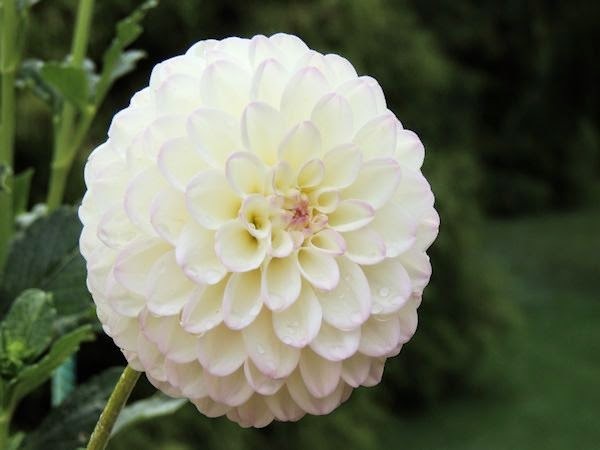 One of the things I admire about autumn are the changes that take place in the garden. 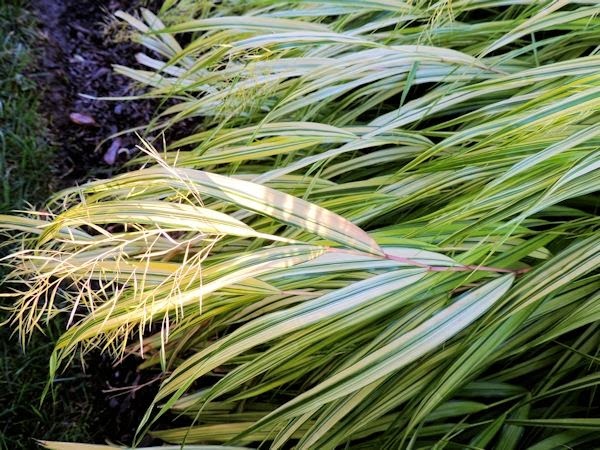 Here the plumes on my dwarf fountain grasses signaling the change in seasons. 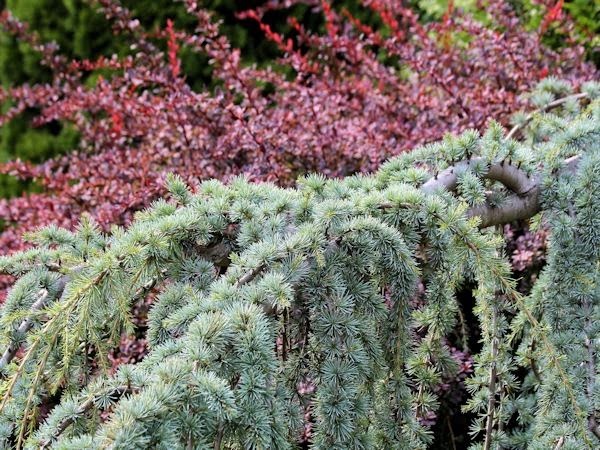 Even the 'Rosy Glow' Barberry starts to change in color this time of year as it goes to shades of pinks and oranges. It is starting to turn here. 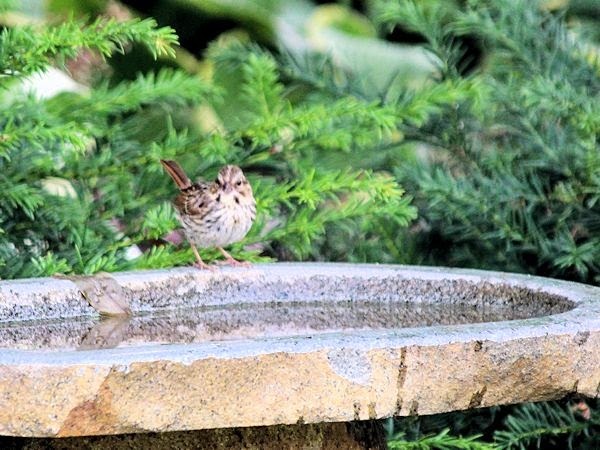 As we end our walk around it is nice to see that a local sparrow is enjoying the bird bath in the back garden as the sun begins to set behind the trees. I hope you enjoyed the walk through my September garden. 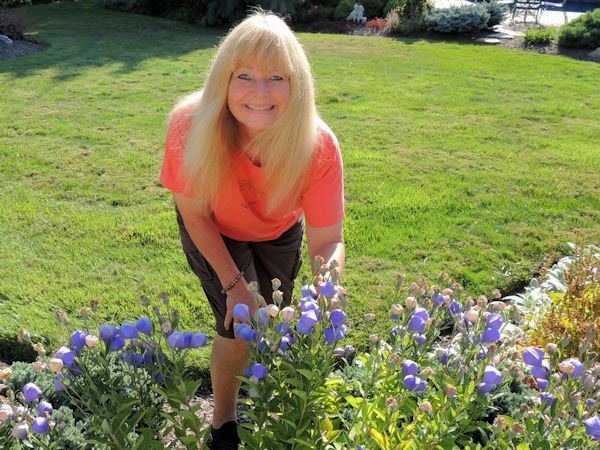 Please visit our hostesses Carol at May Dreams Gardens for Garden Bloggers' Bloom Day and Pam at Digging for Foliage Follow-Up. 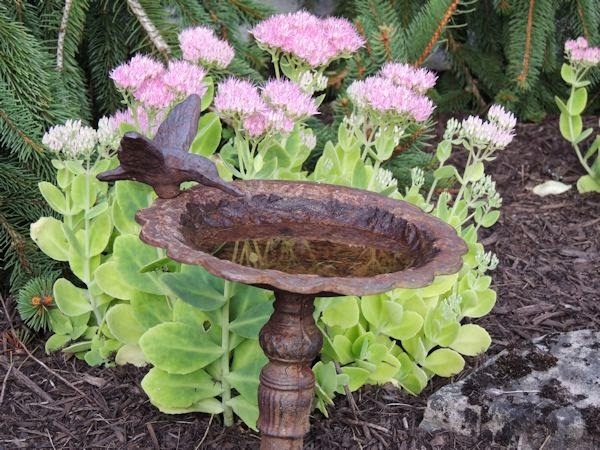 I am also linking up to Creative Country Mom's new Home Sweet Garden Party and Today's Flowers. Thank you so much for visiting and if you leave a note I will know you dropped by to say hello and I will be sure to visit you as well!